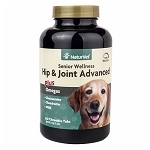 Canine Plus Senior Multivitamin for geriatric dogs combines a balance of vitamins, minerals, essential fatty acids and antioxidants to maintain the physical and mental well-being of senior dogs. Canine Plus Multivitamins are a daily vitamin mineral supplement for older dogs. 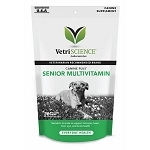 They are formulated specifically to meet the nutritional needs of senior dogs and include amino acids, fish oil omegas and B vitamins. 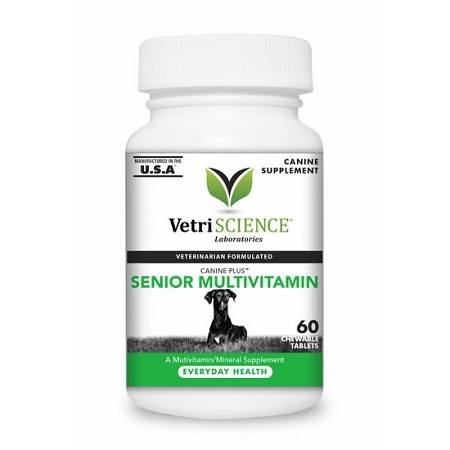 As dogs age, they often have deficiencies in these nutritional factors and Canine Plus Senior Multivitamin is the perfect way to help your senior dog meet those needs. Antioxidants (A, C. E and selenium) to fight free radical damage and support the immune system. A complete and balanced B complex to support mood and memory. 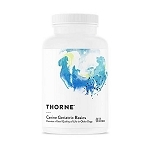 Vital minerals to support proper composition of body fluids, formation of red blook cells, bone structure support and to help maintain healthy nerve function. Canine Plus Senior formula contains the optimal balance of vitamins, minerals, antioxidants, Omega 3s and other nutrients to support your older dog's heart, immune system,liver, vision, and cognitive abilities.